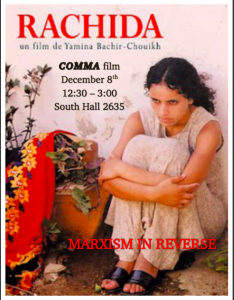 You are invited to COMMA’s final meeting of the quarter! The film will be introduced by Professor Bernadette Andrea, English Department. Bachir-Chouikh’s work will take the discussion of gendered nationalism, which we started with our reading of Fanon, to two different moments of Algerian history: the contemporary time, and the time of the Algerian War of Independence (1954-1962). We recommend you watch beforehand Gillo Pontecorvo’s film _The Battle of Algiers_ (1966). Pontecorvo’s film stream on Youtube or can be watched on Amazon. Here are the links to an analysis of Bachir-Chouikh’s film ([http:/www.aljadid.com/content/womans-struggle-midst-war]http:/www.aljadid.com/content/womans-struggle-midst-war) and Pontecorvo’s (https://www.opendemocracy.net/mani-sharpe/gender-myth-nationalism-gillo-pontecorvos-battle-of-algiers).